What is the color of the lung cancer ribbon? Pink ribbons adorn everything from jewelry to blenders these days, and most people recognize that they stand for breast cancer awareness. 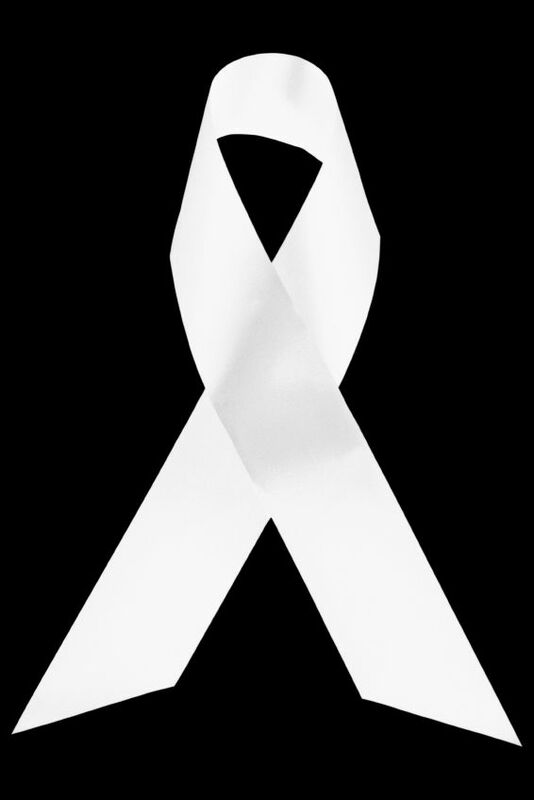 But even though lung cancer kills almost twice as many women as breast cancer, far fewer people know what color ribbon represents lung cancer. In addition, many people are unaware of the awareness events and organizations which cater specifically to people with lung cancer. Yet, even though the title "Susan G. Komen" may be on the tip of your tongue and you may not have heard of those dedicated to lung cancer, it does not mean a lack of growing organizations. Let's talk about the lung cancer ribbon, but also discuss the lung cancer events and organizations who are putting a new face to lung cancer. What Color Ribbon Means Lung Cancer? There is some debate over the exact color of the lung cancer ribbon, but it's usually considered white, or clear, or pearl. And while we have yet to see appliances and garbage cans showing off the white ribbon, lung cancer awareness is thankfully growing steadily. It isn't lost on many of us that the color white -- or translucent -- is less visible than pink. Part of the reason is the stigma of lung cancer -- that is the feeling that people with lung cancer caused the disease themselves by smoking. It's important to point out that 20 percent of women who develop lung cancer have never smoked, and even if someone has smoked they deserve love, compassion, and excellent medical care. At the current time, there are more never smokers and former smokers diagnosed with lung cancer each year than current smokers. We need to spread the word that lung cancer is not a smoker's disease. You may be familiar with breast cancer awareness month in October, but lung cancer also has its own awareness month. The month of November has been designated as lung cancer awareness month, and many activities are now taking place both in November and throughout the year. You don't need to wait until November to help raise awareness about lung cancer. Every day is an opportunity to educate the public about lung cancer. Unlike some cancers that have screening tests, CT screening for lung cancer has only recently been approved and is still limited to those who have smoked and are of a certain age. For the majority of people, we continue to rely on an awareness of symptoms if lung cancer is to be caught in the earliest most curable stages. If you're considering becoming a lung cancer advocate, you have what it takes. All that is needed is a desire, and whatever time you have. Some people advocate full time, while others spend an hour a month or less. Unfortunately, due to the lower survival rates, there are fewer lung cancer advocates than say, breast cancer survivor advocates. Yet you don't need to e a survivor to advocate. We need those who aren't living with lung cancer day to day to fill in the gaps and raise awareness. If you're living with lung cancer, taking care of yourself is most important. That said, much of the progress being made in lung cancer is due to changing the face of lung cancer. Once thought of a disease of smokers, the public is slowly learning that anyone can get lung cancer. People are realizing that young people, never smokers, in fact, anyone with lungs may get the disease. Statistics alone are fairly meaningless. Not in their meaning, but in the support they generate. It's seeing the faces and hearing the stories of those living with the disease that is generating support not only in the public arena but among physicians and lung cancer researchers around the world. Learn more about how to become a lung cancer advocate. Even though the world seems to turn pink during breast cancer awareness month, it's hard to find white ribbons and products that support lung cancer even during lung cancer awareness month. Here are a few places you can find products that support lung cancer research. Free to Breathe offers the Lung Cancer Marketplace where you can purchase pins, earrings, and greeting cards. The beautiful greeting cards are made by a dear friend and lung cancer survivor, Bev Walgrave. Proceeds from purchases go to support programs that hope to double lung cancer survival by 2022. The Dusty Joy Foundation offers a Wish necklace and notecards designed specifically for the foundation to inspire hope for those touched by lung cancer.